I start the vintage glam look with a neutral eye shadow base, and a black liquid eye liner in a strong line along the upper lash line. For the eyelashes, I use a lush mascara that can be accented with individual false lashes for an extra “pop“. I like using a bright crimson red for the lips, and offset the cheeks by a soft and natural blush. This is a timeless look, that has never gone out of style. Guests books at a wedding are great for preserving memories of all the family and friends that were there to celebrate with you and your husband on your special day, but they don’t all have to be the like traditional satin covered books-yours can be as unique as you are. If you and your fiancé have a love of the great outdoors, you could have your guests sign a canoe paddle as your guest book; instead of storing it in a closet, hang it on the wall or above a door of your home. A tree stump could also make a lovely conversation piece; you could use a plate stand to display it for years to come. Do you and your future husband enjoy playing board games? 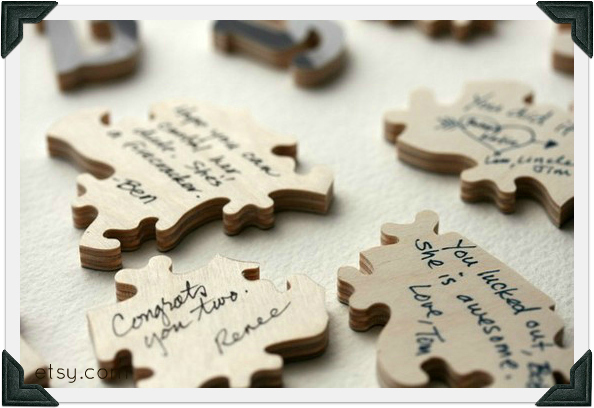 You could buy your favorite, like Jenga, and have each of your guests write a small note a game piece. 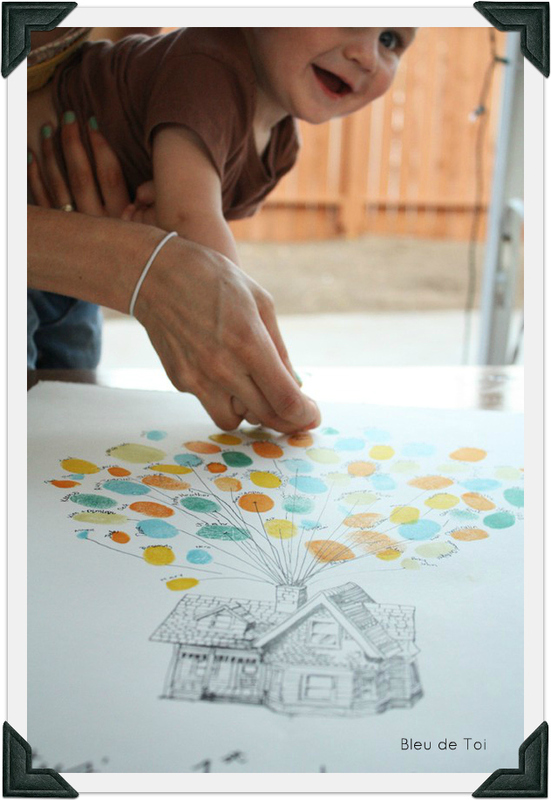 You could also make a personalized jigsaw puzzle and have everyone sign the back. A double sided frame would allow you to show off your puzzle and allow you to see the signatures without covering them up. Do you enjoy getting lost in a good book? 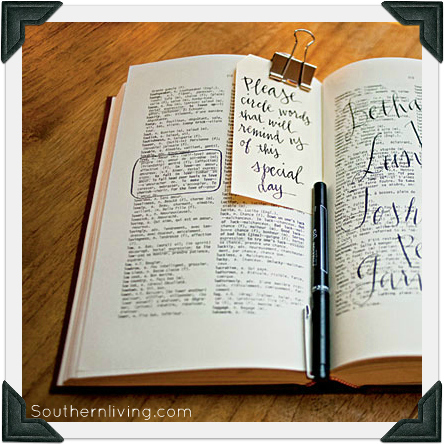 Have your guests put pen to paper and leave you messages in the pages of your favorite novel or use a dictionary and ask your friends and family to circle words that will help remind you of your special day. Is there a place that’s special to you or your fiancé, maybe the place you met, or where he popped the question? 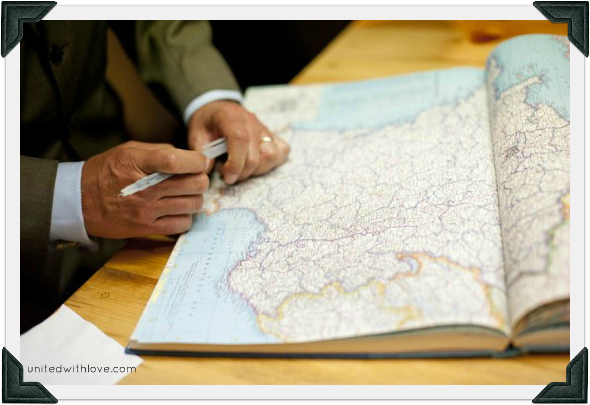 Find a state or city map and add a note to have your guests write their wedding wishes for you. If you’re having a destination wedding, you could find an atlas or a travel coffee book, of where the ceremony is being held and use that for everyone to autograph. Do you or your fiancé play an instrument, or are you part of a band? 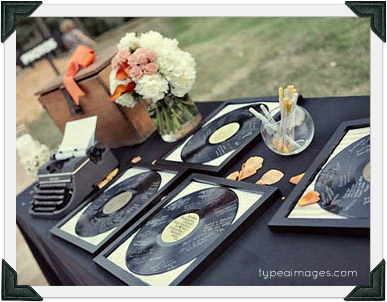 Consider using an inexpensive copy of your instrument to let your guests leave their mark on. Another option is to find a favorite Vinyl LP or album cover and use a metallic pen to sign. 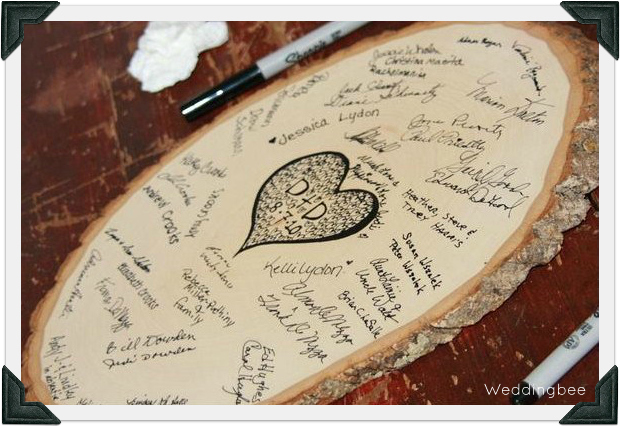 If you’re wanting to have a truly unique guest book find a special print or picture, and ask your guests to add their thumbprints to the canvas; Etsy has many fabulous designs for you to choose from. If you’ve just started planning your wedding, are newly engaged, or if you’re in the final stages of planning, Bridal shows can be an excellent place to find all of your needs for your big day. Going to bridal shows can be better than picking up stacks of wedding magazines or spending hours on Pinterst, because it allow you to see current wedding trends in person and meet the killer vendors in our area. Bridal shows have everything you would possibly need for your wedding day- from D.Js, to invitations and photographers, right down to the silverware and napkins. It’s also a great place to bag freebies! Bridal shows can be stressful, crowded, and overly stimulating, but it is still worth it to go; if crowds really aren’t you’re think consider getting there when the doors open or go later in the afternoon when things should be winding down. Bridal shows are like an awesome right of passage, just like getting engaged, you never will forget your first one. Wear a good walking shoes- you’ll probably be at the bridal show a good 3-5 hours, and you’ll be doing a lot of walking. You don’t want to have to leave the bridal show early because your feet hurt or because you have blisters. Forgo those cute peek-a-boo pumps for your gym shoes; your feet will thank you later. Research what vendors are going to be at the Bridal show, and visit the websites of the company hosting the event; it’ll give you a concrete idea on what to expect and who to keep an eye out for. There are many ways that vendors can advertise their business, having a booth at a bridal show is one way they can invest in, so don’t expect to see the best of the best at every show, but it will still give you a pretty good idea on what’s out there. If you don’t already have one set, have a few wedding dates in mind when you visit with vendors; even if you just have it narrowed down to “sometime in June of next year”, is helpful. Keep in mind some vendors may already be booked for that specific date if you do have one. Eat before you come to the show, but try not to come overly stuffed, remember to leave some room for cake; lots and lots of cake. Bakeries and caterers most often will have free small samples for you to try while you’re there. Bring a few members of your bridal party with you, but let your honey to decide if he wants to come or not. Most bridal shows do have special things for your man, like tux fashions, so if you’re hubby-to-be is honestly interested in going you should take this opportunity to introduce him to all things wedding, but don’t be upset if he tells you he’d rather watch ESPN then brave the bridal shows. Take your girls, have fun, and enjoy being a bride. Do you have any reusable totes in your car? Bring two bags to put all those bridal brochures in. Use one for vendors that you are seriously interested in, and use another for ones that you’re not so crazy about, that way when you go home you won’t spend hours sorting through brochures. Slip in a small notepad and a pen so you can make a note of the vendors you liked the best. Most importantly: pace yourself. Some Bridal shows have as much as 20 to 100 booths, take some time to talk to vendors if there’s one your interested in , ask them questions, like how long have they been in the wedding industry, or if you can see a portfolio of previous weddings they’ve worked on. The Pink Bridal Show– August 19th, Knoxville Convention Center- tickets are $10 and can be bought at the door or online. This is one of the top bridal shows in our region, and will feature a bridal fashion show for the whole wedding party. 29:11 Event Studios– September 30th, Knoxville Zoo- 29:11 Event Studios is having a blow out bridal show, information is coming but this is definitely one you will not want to miss. 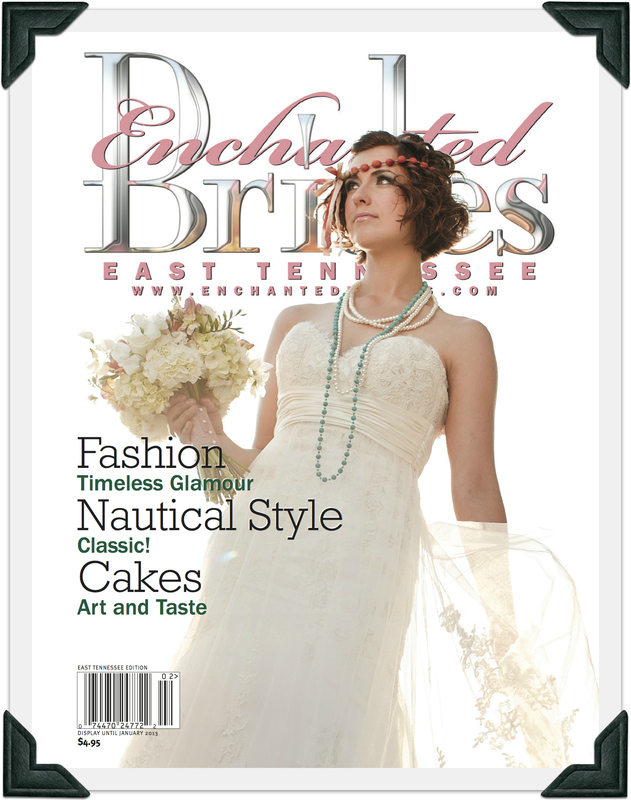 Live, Laugh, Love Weddings is featured in the Summer/ Fall edition of Enchanted Brides magazine; we made the cover! You can view an online edition here. Special thanks to Jennie Andrews Photography, All Occasions Party Rentals, Samuel Franklin Florist, Sugarbuzz Bakers, and make-up artist Amanda McKnight. The article begins on pg. 42. Recently, I went on WBIR, a local TV station in Knoxville, and talked to them about how Brides can support their community with their wedding. After moving to a new home, the July fourth festivities, and losing power for a day and a half in 90 degree weather (which was awesome), I have been musing about the Fall wedding season. I love Fall: the colors, the cooler temperatures, crisp air, and Pumpkin-spice Lattes; I absolutely cannot wait. Lately, I’ve been loving the pairing of yellow and grey; on their own you wouldn’t think these colors would mesh, but together they make a uniquely retro combination that is perfect for a wedding in the Fall. 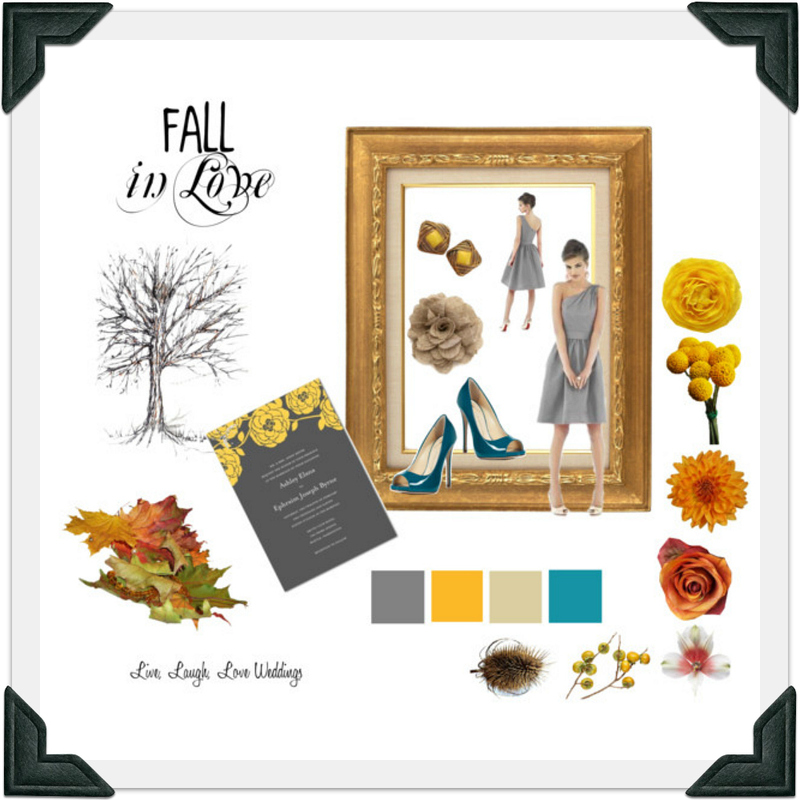 Using the design website, Polyvore, I joined the yellow and grey with a rich teal and an organic burlap. I love using color where it isn’t expected, and the teal pumps for the bridesmaids gives a perfect pop to the grey Dessy dress. 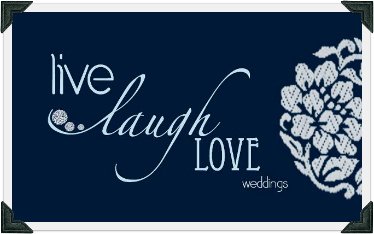 Wedding Paper Divas have an unbelievable collection of invitations that you can customize and preview on their website. In choosing flowers for any event, it’s important to look at what’s in season, your florist would know which ones are. If you do have your heart set on a specific flower that’s off season, they would most likely be able to ship it in; however, it would probably be pricey to do so. For this Fall design, I scoured to find specific flowers that were in season and matched our colors, (of course, a professional florist would have no problem with picking flowers to match your wedding); I absolutely love the combination of the yellow pom-pom Billy Balls and the orangey Dahlias. The options are endless!